P(success) * 7 = ? The break-even TD-success rate would need to be 42% to justify going for the 7 points. The league-average success rate on the 1-yd line is about 65%, meaning all other things being equal, the TD attempt would have been the slam dunk choice. Based on league-wide averages, it would make sense to go for the TD all the way out to the 4 yd line. The other option would have been to instead of the spike, have Luck just QB sneak. This is something the whole team, especially the interior linemen, need to know about in advance. Basically if we're at the 1, in the final seconds with no timeouts, we "fake spike" -- i.e., line up like we're going to spike -- but QB sneak it. That said, I was watching it carefully for that, and Buffalo seemed pretty prepared for that if it was the case. But I think it would have bee the wise call, not just because of the math, but because Indy had at best a 50/50 chance of getting that spike in. I thought Hoculi was very generous with the clock. But... But... But... You can't afford to give the other team momentum going into halftime after a goal line stand! If you ever played football you would know that like all real NFL coaches do. This is real football not Madden, nerd! Can't put a number on intangibles! I'm pretty sure Arians' thought was that the 3 points put the Colts up a touchdown, so that a TD by the Bills would only force OT. The problem with that thought was that it was the end of the 2nd quarter. There was way too much time left to be thinking that way. Not to mention that WP factors in Arians' concern. It sounds to me like you are making assertions without evidence. If there is such a thing as momentum going into halftime, then there should be some evidence for it. Look at teams scoring in the last minute or so of the first half and see if that actually has some measurable affect on performance in the second half. "But... But... But... You can't afford not to give your own team momentum going into halftime after a touchdown! 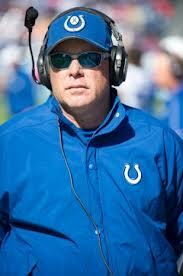 If you ever played football you would know that like all real NFL coaches do. This is real football not Madden, nerd! Can't put a number on intangibles!" Don't you have to consider the fact that the first 3 points will add more to the Win Probability (per point) than the next points after that? (value of FG / 3) > (value of TD / 7) . That is the key right there, the probability of getting a touchdown. If the coach does not know (and, he does not) if he has a 41% chance or better, then it is not a good decision to attempt the TD. The league average is no way a predictive value, past performance is not indicative of future results. The coach may simply estimate he only has a 40% chance of getting the TD. The correct decision to take the almost certain 3 pts, than taking a risk on the TD. And let me explain what it going on here, the coach's mental evaluation of the likelihood of a successful TD is not the same as the calculated league average on similar plays. He apparently concluded it is less likely than the 65% chance stated in the article. It is based on the coaches observation of his team, the opponent, and the plays that have recently occurred. This article seems to assume the coach is just blind about any statistical analysis, or probability of success. Seems unlikely to me that a team of highly paid professionals who spend 85 hours a week on football are unaware of that. I think the coach's estimate is far far better than the calculated league average. For that 65% td rate, what is the breakdown by team for that? I was looking at a chart of 4th down conversions, and was surprised to see that is spread from 0% to 80% from team to team, with that being fairly evenly spread. Of course, many 4th down attempts and in desperation, which may account for some of those lower results, but still, the spread was huge. The calculator is saying 15% because most teams go for the FG. It's not saying 15% if they go for it. This is not a WP discussion. It's a generalized analysis. Re the long comment that ends "Seems unlikely to me that a team of highly paid professionals who spend 85 hours a week on football are unaware of that...I think the coach's estimate is far far better than the calculated league average. ": That's way off the mark in several different dimensions. 1. Coaches, despite your uniformed yet certain opinion, do not track the myriad of possible success statistics in their head like you think. 2. The article does not 'assume' otherwise. It merely calculates the break-even success rate, and provides the baseline league-wide average. There was absolutely no criticism of Arians in the post. 3. The league average is very valuable information. It serves as the baseline or 'anchor,' from which the coach can deviate to make his own estimate of his team's likelihood of success. Google 'base rate neglect' sometime and learn up. 4. Your statement that past performance is not indicative of future results is frankly absurd. Past performance is practically the best possible indication of future results. Are you just repeating something you heard from a mutual fund disclaimer? Regarding the question about team-by-team breakouts for the success rate: The sample sizes are too small to make reliable estimates for individual teams. To overcome the 'desperation' bias you mention, the success rate estimates are taken from make-or-break 3rd down situations, cross-verified with actual 4th down rates. It might be interesting to see how the success rate varies if, for example, you only look at strong offenses against weak defenses or vice versa. In other words, you often include the caveat in these analyses that, for example, if the numbers say that you are infinitesimally better off going for it, knowing how healthy your kicker is and how your offense and the opposing defense differ from league averages becomes important to the decision. The coach in real time has more information than we do going through the statistics five years later (the health of the kicker isn't included in your play-by-play CSV files), but we do have some information that is likely to affect the probability of success; we obviously don't want to chop the data so finely that sampling error overpowers any results, but it would be interesting to see whether an above average offense facing an above average defense succeeds just 65% of the time (i.e., conditioning provides no predictive value) or 66% of the time or 85% of the time. Does a head coach being dumb on offense correlate with also being dumb on defense? For example, if Arians knew that Chan Gailey often makes horrible WP decisions, should he also guess that Gailey will call a dumb goal line defense? I stand by that comment. The coaches estimate of his chances of success for his team against this opponent at least applies to his team in that situation. The league wide average of good teams and bad teams represents neither the good teams nor the bad teams. I base it simply on the fact that I do, and I am merely a occasional fan of the nfl. I am aware of the existence of these stats. All the readers of this site do know these stats and consult them regularly. It seems pretty reasonable that the NFL teams are aware of such statistics. Do you realise your point number 1, right above, directly assumes the coaches "DO NOT TRACK THE MYRIAD OF POSSIBLE SUCCESS STATISTICS IN THEIR HEAD". It is merely a baseline, but certainly not a predictive value. It does not apply to any one particular team. Nor any one specific occasion, which depends on the players on the field, the weather, the coaches, etc. Really, what does 65% league average of past plays mean? It does not mean the colts had a 65% +- 0.5% chance for a first down, on that play. Thank you for the suggestion to "learn up". I enjoy learning. lol. of course. but it is true isn't it? Teams don't have score the same number of points from season to season. They don't have the same wins. They don't beat the same teams. Rules change, the nfl changes, the players change. West coast offenses emerge, tampa 2 defenses counter, air coryell might dominate for a while, 4-3 defenses evolve to 3-4 which evolves to dynamic mixes. There is no basis to state that last year 3-1 were converted 65 out of 100 times, so this year it will also be 65% of the time. well, that says it all right there doesn't it. How about year by year? Division by Division? PS I am a huge fan of the site and your work. Please forgive me if my opinion deviates from yours on occasion. And let me make one last point: The average record in the NFL is 8-8, teams on average win 50% of their games. That does not mean that the Kansas City Chiefs have a 50% chance to beat the New England Patriots. Is there anything we need to consider in terms of risk in these analyses? When we consider investments, we try to look for the maximum expected return for a given amount of risk (or alternatively, the lowest amount of risk for a given expected return) so an investor would prefer a guaranteed $100 over a coin flip for $200. I can see how this might have an application in football - if we estimated our TD% at the break-even point so that our expected return was the same, we'd rather take the practically guaranteed 3 pts from the FG than the TD risk. But does it go further than this? Is it worth risking an almost certain FG (with 2.97 EP) for a TD if the TD% is 45% (so we have 3.15 EP)? Ian, that's why WP is often preferred to EP. The advantage of EP is that it doesn't depend as much on the state of the game, and in a close game that isn't near the end, the relationship between the two is pretty linear. Ian, that is a good point, and one that came to my mind on an earlier topic, on whether punting or going for it was a good idea. (the carolina game iirc "punt away the win"). while the two scenarios were very close, 97% WP for going for it, 96% for punting, if they failed going for it, then the WP dropped to 93%. When you have a guaranteed 96% chance to win, why would you allow the possibility of dropping that to 93%? Lombardi would have gone for the TD.